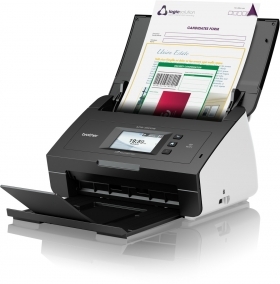 The Brother ADS-2600W is a great, compact scanner and to date it has outperformed it's own spec. The ADS-2600 copes well with mixed paper size batches, It does however sometimes struggle with mixed paper weights batches. Overall, this is a fantastic compact scanner which performs well beyond it's intended capacity, the duplex scanning facility is a great time saver. It is simple to use (our local technophobe picked it up in a matter of minutes) and as a compact takes up very little desk space. Ok but not as easy to set up as some other scanners.